Want to make a fashion statement that is wildly fabulous? Take a break from the ordinary and slip the Digital Graphic Wolf Handbag over your shoulder. This handbag is sure to set you apart from the pack and will have you looking so stylish, you just might feel like howling! A great gift for wolf lovers and animal lovers, this is the purse for the woman who loves to turn heads! The Digital Graphic Wolf Handbag features a photographic print that is made with a state-of-the-art digital printer. This technology makes the pattern incredibly lifelike, so the wolf’s face appears as if it is three-dimensional, and it seems as if the entire bag were covered with its light brown and black fur. A wolf’s head shape enhances the realism of the bag and enhances its style. 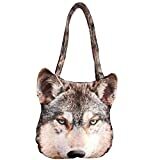 A hobo style design, the Digital Graphic Wolf Handbag measures 12 inches by 12 inches by 24 inches, making it an extra spacious purse for carrying all of your essentials. Double shoulder straps allow you to carry the handbag comfortably, and there is a zipper on top that keeps items from falling out while you travel. Made from luxurious Dupion faux silk, the Digital Graphic Wolf Handbag has a wonderful texture to match its beautiful pattern. The fabric is waterproof and more durable against wear and tear than genuine silk. For simple care, this bag is fully machine washable in cold water. Do not iron it and line dry it in the shade to preserve its rich colors. Go wild with a fashion accessory that is completely unique! Order the Digital Graphic Wolf Handbag. High quality and fashion design. To protect your camera against damages, dust and scratches.